On Monday morning over 5000 Republic of Ireland fans arrived in Dublin Airport, to board planes to take them to the 2016 European Championships Finals in France. They were playing catch up to over 90,000 of their fellow fans who had departed this Island and set up camp in Paris. 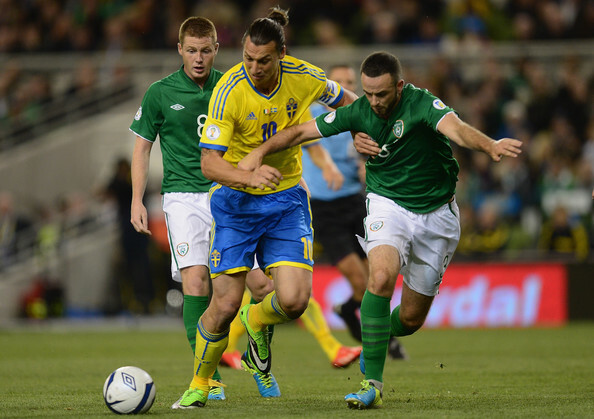 What lay ahead was the opening game of Ireland’s campaign against Sweden. I mingled and spoke with a lot of the fans as they stood in orderly lines waiting to board their planes. The chat was mostly about how we were going to do in the opening game and if any problems lay ahead in France on arrival. A lot of the talk focussed on how much trouble, that had been going on in France over the weekend and how would it impinge on the success of the tournament and their safe passage, there and back. It is amazing how hooligans can ruin it for everyone, even just the worry can ruin a trip before the wheels of the plane have even left the runway. On this occasion the reports coming back were that it had been all organised, especially by the Russians. But the overwhelming feeling of the travelling Irish fans was that they we’re going to the party and they were going to bring that special attitude that all Irish fans are known for, when they travel abroad to the major finals. In their way to an opening success was a Swedish team with one Zlatan up front. What game plan was Martin O’Neill going to use? How would it all pan out? Would we see any of the shenanigans that had brought only doom and gloom around the tournament? Would we fiddlesticks! Ireland had arrived and they wanted to party. Inside the stadium the atmosphere was electric and both sets of supporters were in fine voice. On the field Martin O’Neill could not have been happier with a brilliant performance by his team. Jeff Hendrick, Wes Hoolihan and all the rest of the lads put in a great shift. In fairness if Ireland had taken all of the three points on offer, no one would have begrudged them their victory. The first half performance saw the boys in green go at the Swedes and cause them all sorts of problems. They were unlucky not to take the lead when a Jeff Hendrick shot came back off the crossbar. The way Ireland played in the first half was with total freedom and it was if Martin had told the lads go out and express themselves. It was a team playing without fear and total freedom to do what they wanted. When the goal came, it was created by an incredible run by Seamus Coleman down the Swedish left, his cross was hammered home by Wes Hoolihan on his weaker right foot. It was a goal the Irish totally deserved but unfortunately they were unable to hold onto the one nil lead. Many of you know that I am of the opinion that if you stop Zlatan, you stop Sweden, something John O’Shea should have done for their equaliser. When Zlatan ran at John in the box, the Irish defender should have eased him out towards the goal line and at worst give away a corner. But John failed to do this and allowed Zlatan to get a cross in which unfortunately was put into his own net by Clark. It was schoolboy defending by O’Shea and bad schoolboy defending at that. A lot of people were pointing the finger at Clark after the game but the blame in my opinion should have been aimed at John O’Shea, a player with his experience should have done better. In the end it was a point well earned and probably something every Irish fan would have hoped for before the game. On the down side of things Jon Walters picked up an achilles injury which will make him doubtful for the rest of the tournament. Up next for Ireland are Belgium on Saturday. The game will bring all sorts of new challenges for Martin O’Neill to have a look at. The Belgians are coming into the game after a defeat to Italy in their opening match. They were not only beaten by the Italians but they were awful, it was a very poor display by such a talented team. The Belgians have now got to beat a jubilant and very confident Ireland team. From an Irish point of view, in my opinion if Martin O’Neill’s men can produce another performance like the one on Monday, they stand a real chance of getting something out of the game. As I am putting this article together it looks like Walter,s will be out for this one and I expect James McClean to start in his place. I doubt if there will be any other changes as the team is still buzzing since Monday. One thing that is certain, no matter what happens, the Irish fans will party before, during and after the game. So come on you Boys in Green and get us a result that might just take us out of this group. Hard work, passion and cool heads will get the job done.